While significant insights have been gained, the field of factors underlying firm success is still highly fragmented, often oversimplifies the interrelation between success factors, and remains inherently static in its approach. Sebastian Raisch establishes three models to address these limitations and validates them in a field study of global media enterprises. 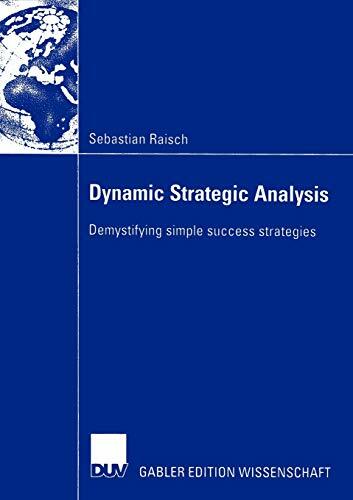 The foremost activity as far as strategy management is concerned has always been the analysis of factors underlying firm success. While significant insights have been gained, the field is still highly fragmented, often oversimplifies the interrelation between success factors, and remains inherently static in its approach. Sebastian Raisch establishes three models to address these limitations and validates them in a field study of global media enterprises. The integrated model combines the most relevant determinants of company performance into a single model and the complex model captures the interrelations between these determinants. Furthermore, the evolutionary model encompasses the evolution of these determinants over time. The combined results provide a state-of-the-art view of the factors and effects underlying firm performance. Dr. Sebastian Raisch promovierte bei Prof. Dr. Gilbert Probst am Lehrstuhl für Management und Organisation der Universität Genf, Schweiz. Er ist als Projekt Manager am Institut für Management der Universität St. Gallen, Schweiz, tätig.